We've had some happy news in our house. Earlier this year our daughter applied for an IB Program (International Baccalaureate) at a High School she very much wanted to get into, it's out of our district, and they are almost always over subscribed in applications, so getting in is not a guarantee. We've been waiting on pins and needles and got the call today, she's IN! Woo HOO. She'll be going to school with one of her very best friends from church, lots of other kids from church and one of her best friends from JH. We're so grateful! AND, son #1 applied for a special program in the Junior High he'll be going to in the fall....we also found out last night, he's IN! And he's overjoyed, so are we! It's amazing how much energy you put into "waiting", but we also feel so happy to know our kids are in the palm of God's hand, and we're looking forward to what next year had in store, despite the crazy-ness of having a HSer, a JHer and an Elementary kid! 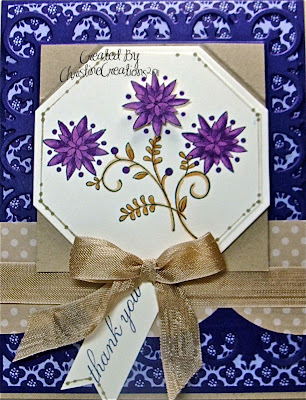 Here's a bit closer, I added some dots into the outline with my Stampin' Write marker in Kraft to match the blossoms. 2. Lately I've had more friend requests on facebook, and you'll also notice I haven't responded. There's a reason - honest. Facebook for me is primarily ministry related. My husband and I are Youth Pastors and we work with minors. So, facebook is primarily work (as in ministry) and personal. And because I work with minors I need to be really careful what's on my page and who sees it. So, in that way I'm pretty private. Just so you know - I don't post anything creative or any of those type of notices or links there. I try and keep my two little worlds separate. 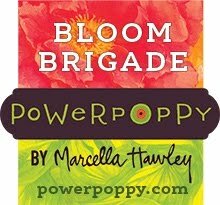 Blog for creative, fb for personal and ministry. So, that's the FYI for you, I'm really not trying to be a snob or anything! wow christine what a lovely image and your card looks stunning. 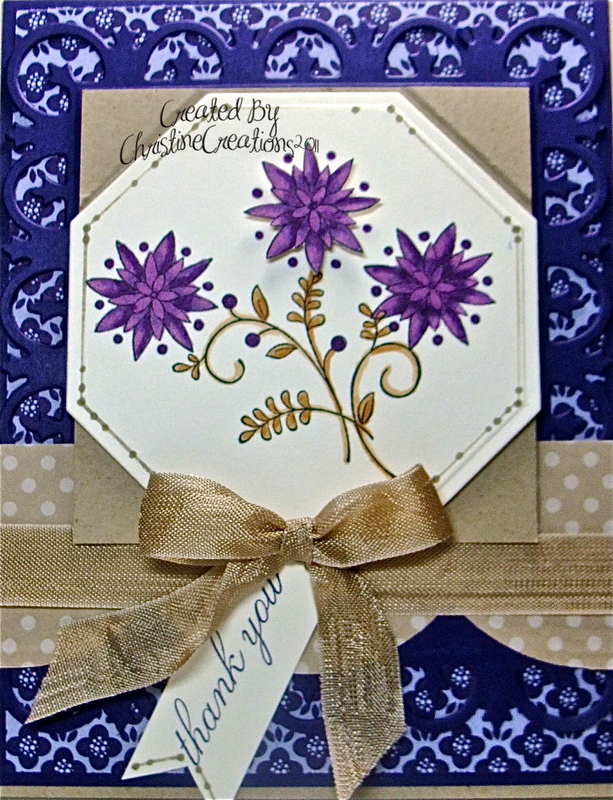 Gorgeous card - love the shape around the flower images. As for FB, I wouldn't worry about it. You are more than correct with your thinking. I'm leaning towards going that way myself (which unfortunately means deleting some people now!) but know others have set up a separate FB account for cards so that may be a route to go. This technology is hard to keep up with LOL! What Great news for the whole family... It should like they must work very hard and have been rewarded for doing so. Your card is Lovely! When I was young... many, many moons ago, I really didn't like purple.. but now... I LOVE it and this card is just perfect! Love this one and the birdhouse one from yesterday also. Gorgeous and Congrats to the kids, that's awesome! Nice to see God's plan unfold for your children and that they now can plan for next year. 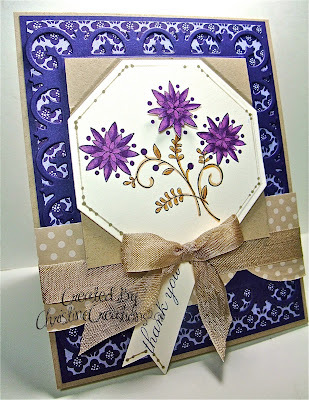 Beautiful card, like the layering and the way you trimmed the edges of your image - and of course the colors are delish. Absolutely stunning girl!Congrats on the wonderful news! Beautiful card Christine - wonderful news about the kids. You must be a proud Mom right now. WOW, I really like how the flowers pop off the cards. Congrats on the kids getting into their programs. I have a HSer on facebook and a pretty open relationship with most of his friends. I keep in touch with them and what's going on in their lives. It also seems to be the only place I learn about his club events. I like the idea of starting a page just for my crafts. Gorgeous card Christine. I'm so happy for you and your children. Chritine: Glad to hear your comment about your Facebook page. I agree that everyone needs to be selective about what goes out about him/herself and family. We need to be more private than Facebook promotes. Good for you. There are some "wacky" people out there. A big congrats to your kids, I bet it is nice to have the waiting over! Good luck to them both! Your card is lovely, I am seeing alot of purple lately, may have to try that myself soon, I know what you mean about keeping those things separate, I am the same way.